2004 – In memory of Ian the Ian Daly Swim A Mile With A Smile is launched at Westwood leisure Centre in Dublin. Barretstown is added to Crumlin Hospital as beneficiaries of the proceeds raised. Ray Darcy, Éamonn Coughlan and Paul McGrath all support the swim which raises €7,700. 2005- Because of the popularity of the swim in 2004 the swim is moved to the National Aquatic Centre in Dublin. Colin Farrell offers his support to the swim and with his help €70,000 is raised. 2006- Swim Ireland affiliated clubs take part this year along with swimmers all over the country take part in the swim this year and €32,500 is raised for the two charities. 2007- RTÉ television’s Nationwide programme feature the swim on one of their programmes and the swim raises €43,000. 2008- The band, U2, lend their support to raising the profile of the swim and with their help the swim has its best fundraising year and raises €100,000. 2009- Many of the swimmers from previous years return to complete the sponsored swim again and it raises €50,000. 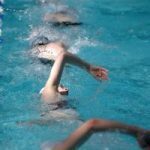 2010- Many schools take on the swim as a project and complete it as part of their PE programme. This initiative helps the swim raise €36,000. 2011- Schools continue to be involved in the swim and along with the swimmers who return each year, the swim manages to raise €37,000. 2012- Swimmers take part in the swim in Sydney, Australia and Vietnam. The swim raises €23,400 this year. 2013- The Aura Leisure centre franchise start their involvement in the swim which raises €26,500. 2014- This year some non-swimmers climb mountains and run the Mini-Marathon in an effort to support the two charities. €32,000 is raised. 2015- Some leisure clubs and public pools around the country sign up to take part and help the swim raise €34,200. 2016- With the help of publicity from Q102 the swim raises €25,000. 2017- As more schools become involved in the swim, €27,000 is raised and the swim’s popularity continues to rise.